Posted June 22, 2018 by Josette Farrell in News. 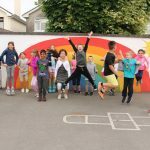 The Galway Educate Together Second Level Startup group (GET2LS) will hold a public meeting on Monday 25th June, for parents interested in learning about the Educate Together model, in the context of the current patronage competition for a new school in Galway. The patronage process is currently underway. The next stage is for the Department of Education and Skills (DES) to survey parents of potential students (those due to enter second-level between 2019 and 2023) on their preferences. This meeting will provide information on the Educate Together ethos and model, and invite parents to complete Expressions of Interest in support of an Educate Together school. The meeting will be addressed by representatives of Educate Together, including Regional Development Officer Jennifer Buttner. Local representatives (TDs, Senators, and Councillors) have been invited to attend, and it is expected that several will be in attendance. The MCs for the evening will include pupils currently enrolled in local Educate Together primary-level schools. Representatives of GET2LS and Educate Together will be available for interview both in advance of and following the event – see contact points below to arrange these. In particular, Jennifer Buttner will be in town until Tuesday 26th, and will be available for broadcast and other interviews on Tuesday morning. The event will also include photo opportunities for media representatives.